Half pound burger, white cheddar, bacon, roasted jalapenos, creamy peanut butter, sweet onion jam on brioche bun…. BOILER UP!! 12" | 14" | 16"
Join us every Saturday and Sunday for Brunch... 11am to 3pm. 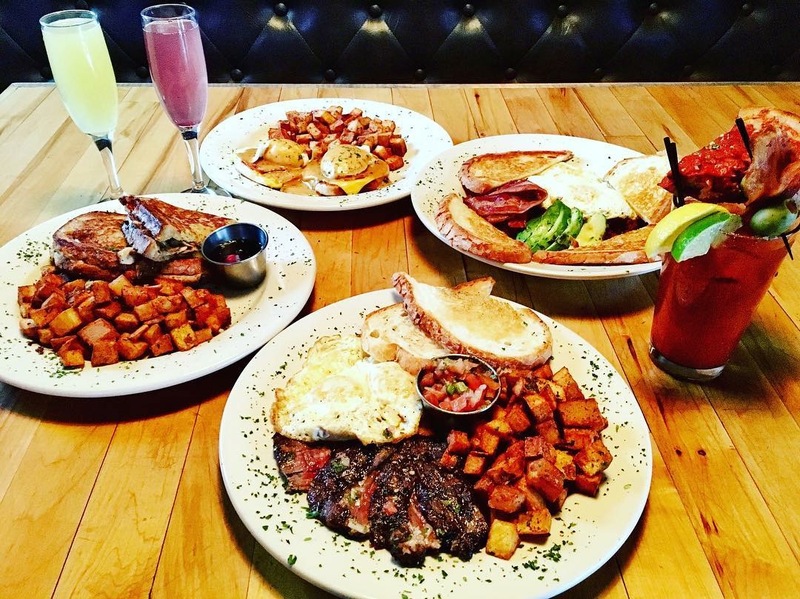 Choose from our regular food menu or Brunch menu. Drink Specials include $3 Mimosas, $6 Bloody Mary w Cold Pizza Slice, and more! (2) Eggs, Saussage links, Applewood Smoked Bacon. Served with American Cajun Potatoes. Choice of Toast or Tortillas. Scrambled Egges, Sausage Links, Applewood Smoked Bacon, American Potatoes, with shredded white cheddar, wrapped in flour tortilla. Served with American Cajun Fries. 10" pizza with eggs, sausage links, applewood smoked bacon, amercian cajun potatoes, mozzarella & provolone cheese. English Muffin with (2) Poached Eggs, American Cheese, Avocado, and Chorizo Gravy. Served with American Cajun Potatoes. Handcut French Fries topped with our homemade chorizo gravy (with bell peppers) and melted cheese curds topped with an egg. (2) fried eggs on Italian brea with American Cheese, Applewood Smoke Bacon, Garlic Aioli, Roasted Jalapenos. Served with American Cajun Potatoes. Corn Tortillas, scrambled eggs, giardineria, topped with hot sauce. 10" Pizza with Nutella, topped with fresh cut strawberries and bananas, whipped cream, and chocolate drizzle. Enjoy some of our speciality Brunch Cocktails every Saturday and Sunday! Kyoto Black Cold Brew Coffee (Made Locally in Chicago), Baileys Irish Cream, Godiva White, Whippped Cream. Cutwater Spirits Bloody Mary, Bud Light, Lime Juice, Worcestershire Sause, Hot Sauce, Cajun Powder Rim, Garnished with Olives, Lime, & Pepperoncini. Kyoto Black Cold Brew. Chambord, Godiva White, topped with whipped cream. Jameson & Butterscotch Schnapps Shot. Side of Orange Juice & Piece of Bacon. Available Saturdays and Sundays for $3 by the glass or $15 Carafes, Flavors include Orange Juice, Banana, Strawberry, Raspberry, Blueberry, Mango, Peach, Black Cheery, & Kiwi.